Not a week has passed in this magnificent new year and already Gidday from the UK is bringing you delight from around the globe – Turkish Delight that is. Jack Scott is a fellow expat – an Englishman in Turkey (Bodrum in fact) – and he’s written a book. His blog, Perking the Pansies is his catalogue of daily thoughts on the world of two gay men in foreign land – in turns thought-provoking and funny, always witty and honest. This is not just a collection of blog posts. Rather Jack weaves the tale of the dichotomous life of an expat with poignancy and humour. The wondering where you belong, what ‘life’ to build and how to bridge the gap between life BE (Before Expat) and the unfamiliar ‘now’ remains as relevant to me now as eight years ago when I arrived in the UK and I look forward to finding out what happens next for Jack and Liam. So without further ado, I am proud to present Gidday’s first guest for 2012, Jack Scott. Here on Gidday from the UK you’ll read about an Aussie girl’s life in Blighty and beyond, her thirst for reading and her need to scratch those itchy travelling feet. Her writing is eloquent, varied, fun and informative. I’ve always got along with Antipodeans. We share similar cultural roots and laugh at the same things, but our cousins Down Under aren’t afflicted with the same level of debilitating cynicism that stalks many Brits these days. I find this refreshing. To my eternal shame, I’ve never been to Oz. My partner, Liam, has. He loved it and wanted to stay. Forever. He even considered re-training as a hairdresser to gain enough points to emigrate (crimpers were in short supply at the time, apparently). From civil servant to coiffeur would have made a dramatic career change. He thought better of it when he realised it was a gay cliché too far. That was before he met me, of course. When Gidday writes about London, it’s like a magical trip down memory lane for me. I enjoy our current lives as a wanton Lotus Eaters here in Turkey, but London Town is my home town and it’s where my heart is. I love Turkey but I’m in love with London. 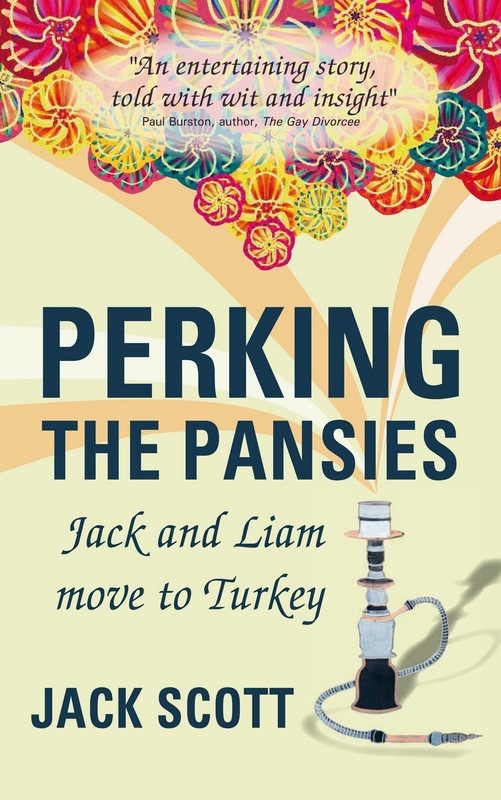 This ‘here and there’ tension is one of the recurring themes of my new book, Perking the Pansies, Jack and Liam move to Turkey. Were we insane to sell up, chuck in the jobs and move lock, stock and barrel to a Muslim country? Well, we’re still here but it’s been a rocky road. When I was recently asked to sum up our time in Turkey, I struggled to paraphrase the complexity of our experiences and emotions: ‘misery and joy, bigotry and enlightenment, betrayal and loyalty, friendship, love, earthquakes, birth, adoption and a senseless murder.’ Life in the Smoke was never this eventful. You couldn’t make it up. Thank you so much to Gidday for featuring Perking the Pansies on the Book Nook list. I’m in elevated company. If you like what you see, the book is available on paperback and Kindle at Amazon.co.ukand Amazon.com. ps…If you want to see what I thought, pop over to The Book Nook and check out No. 57. Alternatively, if you are looking for a veritable pantheon of praise, I and many others have spread the word on Amazon so you can click here for that. This entry was posted in cracking reads, Expat moments and tagged Jack Scott, My Special Guests, Perking the Pansies by Kym Hamer. Bookmark the permalink. Welcome Alien! Don't forget your swag…. I'm about to get my first taste of Turkish delight as in a couple of weeks I'll be in Istanbul and Izmir for work. I can already see a follow up post! I'm really chuffed to be featured as your first guest blogger for 2012. Thank you for your kind words and support. I really appreciate it. Cheers!